Ho-ho, how do you celebrate a Christmas birthday? With the most adorable Christmas birthday party, of course! Just because a girl or boy is born at Christmas-time doesn’t mean they can’t have a birthday party (unless they’re on the naughty list). This party is proof positive that nothing has to be left out at a birthday party held during the holidays. There were invitations, holiday decorations, special outfits, a dessert table and even a favor station. What a great way to kick off the Christmas season. This caroling inspired Christmas party will spark imaginations! Get in the spirit easily with over 200 free Christmas printables! 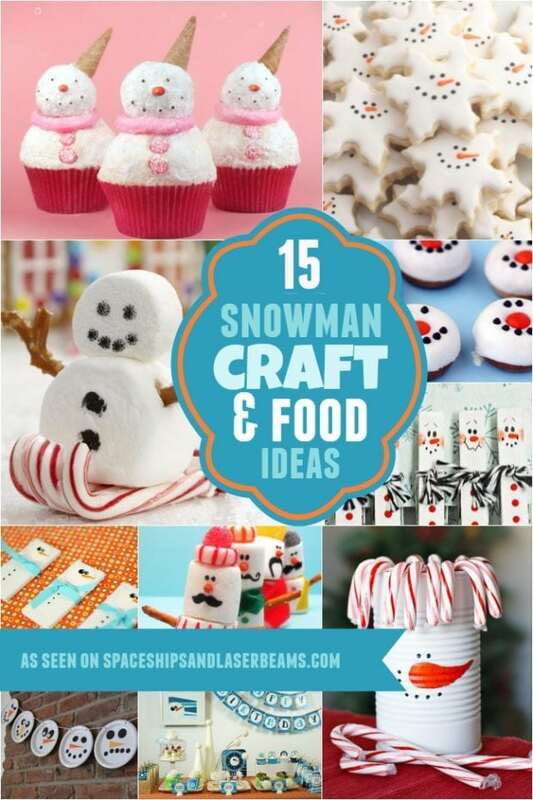 Check out these Elf on the Shelf ideas as well. Your kids will love these free printable letters from Santa. Cake, cookies and treats galore might give you the idea that someone wants to celebrate. That someone in this case is Christina, of 4 Kids Cakes. She wanted her children to celebrate the season with a special themed gathering. Although I enjoy non-traditional holiday colors, I really like the classic red, white, and green in this party. Pictures, from Stephanie Vogel Photography, give us a sneak peek of the festivities. The kids must have thought they’d been transported to Candyland when they spied the party! There were lots of specially crafted treats for this cookie themed event: a giant cookie cake, a macaron tree, cake pops, brigadeiros, mint chocolate chip cookies, chocolate covered Oreos, cake in a jar, sugar cookies, mini donuts, chocolate covered pretzels and fortune cookies, peppermint sticks and rock candy swizzle sticks! The dessert table wears a red skirt and a burlap runner, trimmed with greenery and pine cones. I like the way the twin Christmas trees, pine wreath and burlap reference the outdoor setting. A “Merry Christmas” pennant banner invites closer inspection of the huge assortment of goodies. Snippets of fabric from the kids’ outfits have also been used for decorations on the tree and tables. Background papers from the party printables (via PartyOn!Designs) have been repeated on tree ornaments. All of these repeats give cohesiveness to a party with lots of patterns: nice! Of course with all of the treats there must be something special to drink, too. A darling hot chocolate bar with three flavors of hot cocoa lets the kids mix favorites for each other. Marshmallow snowflakes-on-a-stick (I want one!) and chocolate and peppermint dipped spoons can be used for stirring and tasting. A kid sized table was decked out for the celebration, too. Extra touches like elf-shoe or hair bow napkins garner grins. Place cards, flagged straws and wrapped milk bottles look party ready. I am in love with the napkins that were folded to look like Elf hats! More fabric trees, mini subway art and colorful banners add a lot to the table setting. Before heading home the kids were invited to stop at the red table favor station to fill take home boxes with sugar cookies and candy kabobs. 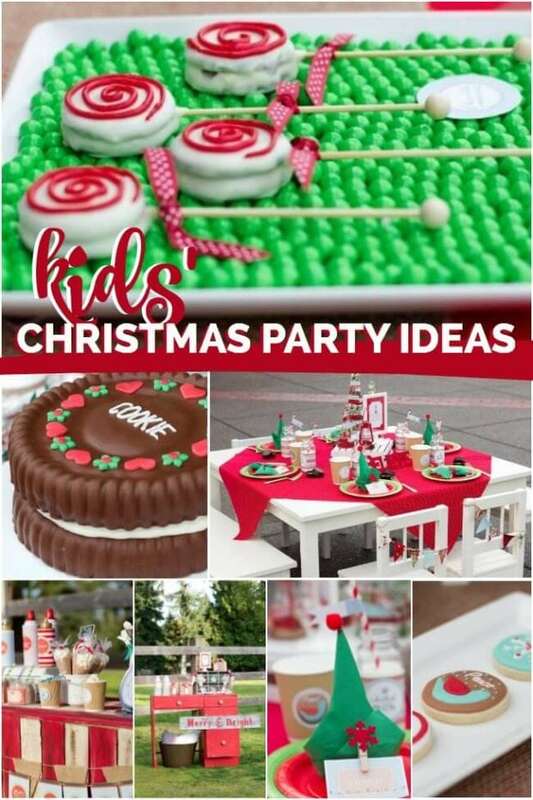 There are lots of cute ideas for a special kids’ celebration in this homespun Christmas party. You’re sure to find some inspiration for your home! Love this Christmas party? Here are some of our favorite products!